A series of 6 - bromine - 2, 3-dissubstituted quinoline compounds have been synthesized and their structures were confirmed by MS and H NMR. The preliminary pharmacological screening showed that these compounds expressed anti-mycobacterium tuberculosis H37Rv activity. Tuberculosis is currently one of the major infectious diseases [1,2], according to World Health Organization (WHO), there are more than eight million people who infect with tuberculosis each year in the worldwide, about 1.3 million people died of tuberculosis in 2012 . In the past five decades, there had not been even one kind of better medicine on the market, until the initial stage of 21 century . There are some barriers to improvements in the research including long treatment duration (resulting in poor patient adherence and loss of patients to follow-up), complex regimens that involving expensive and toxic drugs, toxic effects when given with antiretroviral therapy, and multidrug resistance [5,6]. After 50 years of no anti-tuberculosis drug development, recently a new kind of anti- tuberculosis drugs, to abbreviate TMC-207 which expressed new mechanism for the anti-tuberculosis activity got researchers’ attention. It was supposed that the functional mechanism inhibited the proton pump of ATP synthetase  which can express high inhibition value of MIC = 0.06 μg.mL-1. The structure-activity relationship  states that: 1) Bromine in the aromatic ring is essential to the activity and cannot be replaced by other substituent; 2) The methoxy group is also beneficial to the activity; 3) keeping the length of the side chain is essential to the activity (Schemes 1 and 2). 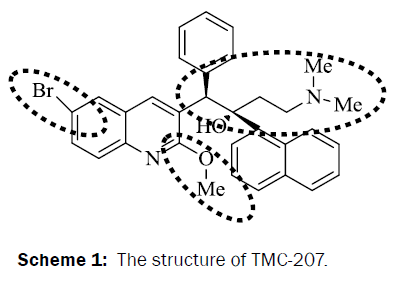 Scheme 1: The structure of TMC-207. 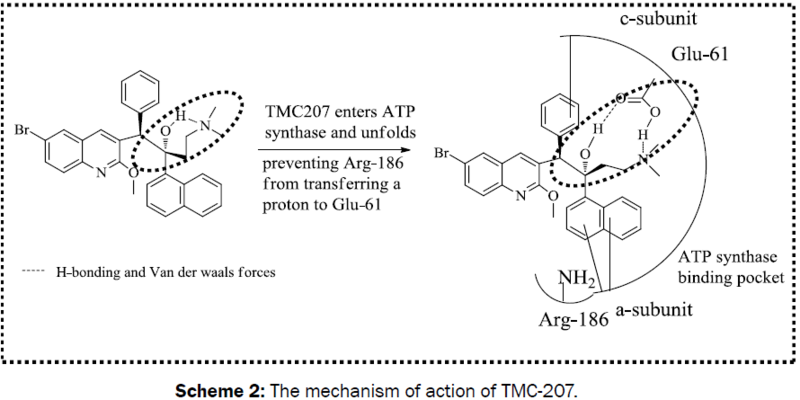 Scheme 2: The mechanism of action of TMC-207. Based on the structure-activity relationship, some modification has been made: naphthalene ring and the benzene ring have been changed to quinoline and pyridine ring which may form the hydrogen bond and increase the connection between the compound and the amino acid of Glu-61 and Arg-186. And then a serial of new compounds have been designed and synthesized. The synthetic procedure of the new compounds is described in Scheme 3. Scheme 3: The synthetic procedure. According to some similar procedure [9-14], 3-(pyridin-2-yl) propanoic acid was chosen as the starting material after chlorination and amidation, 3 was separated, which was reacted with DMF to form the quinoline ring through Vilsmeier-Haack cyclization. During the cyclization step, two products can be separated but when one-spot method was chosen, after Williamson etherification, only 6 were separated. Treated with NCS [15-17], 7 was obtained. Then 8 was separated with the reaction of 4 - aminoquinoline and 7. And then, the side chain was linked to the nitrogen atom, 10 was finally separated (Table 1). 10a 1 556.1 8.46(d, J = 8.0,1H), 8.38(d, J = 8.0, 1H), 8.17(d, J = 7.6, 1H), 8.14(d, J = 7.6, 1H), 7.96(s, 1H), 7.91(s, 1H), 7.51-7.63(m, 5H), 7.30-7.42(m, 3H), 6.10(s, 1H), 3.85(s, 3H), 3.25(s, 2H), 2.27(s, 6H). 10b 1 586.2 8.44(d, J = 8.0,1H), 8.36(d, J = 8.0, 1H), 8.16(d, J = 7.6, 1H), 8.12(d, J = 7.6, 1H), 7.96(s,1H), 7.93(s,1H), 7.50-7.65(m, 5H), 7.31-7.40(m, 3H), 6.12(s, 1H), 4.60(s, 2H), 3.86(s, 3H), 2.24-2.28(m, 4H),1.18(t, J = 4.8, 6H). 10c 1 579.0 8.46(d, J = 8.0,1H), 8.38(d, J = 8.0, 1H), 8.15(d, J = 7.6, 1H), 8.10(d, J = 7.6, 1H), 7.95(s, 1H), 7.92(s, 1H), 7.83(s, 1H), 7.52-7.65(m, 5H), 7.30-7.41(m, 3H), 7.11(d, J = 7.6, 1H), 6.75(d, J = 7.6, 1H), 6.12(s, 1H), 4.65(s, 2H), 3.85(s, 3H). 10d 1 611.2 8.42(d, J = 8.0,1H), 8.34(d, J = 8.0, 1H), 8.14(d, J = 7.6, 1H), 8.10(d, J = 7.6, 1H), 7.95(s, 1H), 7.92(s, 1H), 7.50-7.65(m, 5H), 7.30-7.38(m, 3H), 6.10(s, 1H), 4.64(s, 2H), 3.80(s, 3H), 2.12-2.20(m, 8H),2.00(s, 3H). 10e 1 598.3 8.44(d, J = 8.0,1H), 8.35(d, J = 8.0, 1H), 8.18(d, J = 7.6, 1H), 8.14(d, J = 7.6, 1H), 7.95(s, 1H), 7.92(s, 1H), 7.53-7.66(m, 5H), 7.32-7.40(m, 3H), 6.14(s, 1H), 4.64(s, 2H), 3.83(s, 3H), , 2.44(t, J = 4.8, 6H). 10f 2 570.1 8.46(d, J = 8.0,1H), 8.35(d, J = 8.0, 1H), 8.16(d, J = 7.6, 1H), 8.13(d, J = 7.6, 1H), 7.95(s, 1H), 7.93(s, 1H), 7.51-7.63(m, 5H), 7.30-7.42(m, 3H), 6.10(s, 1H), 3.85(s, 3H), 3.50(t, J = 6.4, 2H), 3.24(s, 2H), 2.58(t, J = 6.4, 2H), 2.27(s, 6H). 10g 2 600.2 8.44(d, J = 8.0,1H), 8.36(d, J = 8.0, 1H), 8.14(d, J = 7.6, 1H), 8.12(d, J = 7.6, 1H), 7.94(s, 1H), 7.91(s, 1H), 7.52-7.66(m, 5H), 7.31-7.40(m, 3H), 6.15(s, 1H), 3.87(s, 3H), 3.51(t, J = 6.4, 2H), 2.58(t, J = 6.4, 2H), 2.24-2.28(m, 4H), 1.19(t, J = 4.8, 6H). 10h 2 591.0 8.46(d, J = 8.0,1H), 8.40(d, J = 8.0, 1H), 8.18(d, J = 7.6, 1H), 8.14(d, J = 7.6, 1H), 7.95(s, 1H), 7.91(s, 1H), 7.82(s, 1H), 7.52-7.65(m, 5H), 7.32-7.45(m, 3H), 7.10(d, J = 7.6, 1H), 6.76(d, J = 7.6, 1H), 6.15(s, 1H), 4.62(s, 2H), 3.86(s, 3H), 3.52(t, J = 6.4, 2H), 2.60(t, J = 6.4, 2H). 10i 2 625.5 8.42(d, J = 8.0, 1H), 8.30(d, J = 8.0, 1H), 8.10(d, J = 7.6, 1H), 8.06(d, J = 7.6, 1H), 7.90(s, 1H), 7.84(s, 1H), 7.46-7.60(m, 5H), 7.32-7.40(m, 3H), 6.12(s, 1H), 4.60(s, 2H), 3.80(s, 3H), 3.50(t, J = 6.4, 2H), 2.56(t, J = 6.4, 2H), 2.12-2.20(m, 8H),2.00(s, 3H). 10j 2 612.2 8.44(d, J = 8.0,1H), 8.34(d, J = 8.0, 1H), 8.20(d, J = 7.6, 1H), 8.10(d, J = 7.6, 1H), 7.95(s, 1H), 7.92(s, 1H), 7.53-7.66(m, 5H), 7.32-7.40(m, 3H), 6.14(s, 1H), 4.64(s, 2H), 3.83(s, 3H), 3.50-3.58(m, 4H), 2.58(t, J = 6.4, 2H), 2.44(t, J = 4.8, 6H). 10k 3 584.2 8.40(d, J = 8.0,1H), 8.32(d, J = 8.0, 1H), 8.10(d, J = 7.6, 1H), 8.10(d, J = 7.6, 1H), 7.93(s, 1H), 7.90(s, 1H), 7.45-7.54(m, 5H), 7.32-7.38(m, 3H), 6.08(s, 1H), 3.83(s, 3H), 3.52(t, J = 6.4, 2H), 3.20(s, 2H), 2.50-2.58(m, 4H), 2.27(s, 6H). Table 1: Analytic data for the target compounds. Target compounds were screened in H37Rv cells with isoniazide as positive control. The results of preliminary biological assay were shown in Table 2. Though the activity does not seem to be of advantage comparing with the collar compound, all of these targeted compounds showed positive effect on the anti-tuberculosis (Figure 1). Tabel 2: The inhibitory concentration of anti-Mycobacterium tuberculosis H37Rv on TMC-207 derivatives. Figure 1: Mycobacterium tuberculosis cultured on 7H10 solid medium with different compounds with the ratio of 0.5 mg/ml. 1) Treated with10a; 2) Treated with 10b; 3) Treated with 10f ;4) Treated with. The experiments were repeated three times, and typical images are shown. Comparing with isoniazide and TMC-207, the target compounds all showed some inhibition activity of anti-Mycobacterium tuberculosis H37Rv, but the inhibition ratio is much lower than isoniazide and some compounds showed similar activity as TMC- 207. Among these different compounds, the compounds with proper length of side chain (10f-j) showed better inhibition activity than others which means the length of the side chain expressed tight connection with the inhibition activity and should be kept. Comparing with TMC-207, the introduce of pyridine ring and quinolin ring did not expressed any advantagement which means the hydrogen bond had little effect on the activity. The variation of the N-terminal side chain expressed different activity, it was found that dimethyl, 4 - methyl piperazine and morpholine was beneficial to the activity. In conclusion, a serial of 6 - bromine - 2, 3-dissubstituted quinoline compounds were designed and tested for the inhibition of tuberculosis. Partial inhibition activity can be detected and the modification of the compounds showed some beneficial improvement. All chemicals used were purchased from Amresco unless otherwise stated. Mycobacterium tuberculosis H37Rv was purchased from ATCC and it was cultured in Middlebrook 7H9 broth (glycerol and polysorbate 80 was added) in accordance with Middlebrook ADC enrichment or 7H10 agar solid media supplemented with OADC (ADC + 0.003% oleic acid) [Allen, B.W. Mycobacteria. General culture methodology and safety considerations. Methods Mol. Biol. 1998, 101, 15-30.]. The authors gratefully acknowledge financial support from the hospital and the other people who involved in the procedure of the research. WHO. TB-a global emergency. WHO Press Release: WHO/31. Geneva: World Health Organization. 1993. Alimuddin IZ, et al. Lancet Infect Dis 2014;14:327-340. WHO.Global Tuberculosis Report.World Health Organization: GenevaSwitzerland. 2013. Andries K, et al.A diarylquinoline drug active on the ATP synthase of Mycobacterium tuberculosis. JScience.2005;307:223-227. Antituberculosis agents. Clinical and research information on druginduced liver injury. Huang YS. Journal of the Chinese Medical Association. 2014;77:169-173. Koul AN, et al. Diarylquinolines target subunit of mycobacterial ATP synthase.J Nat ChemBiol2007; 3:323-324. Upadhayaya RS, et al. Design, synthesis, biological evaluation and molecular modelling studies of novel quinoline derivatives against Mycobacterium tuberculosis. J Bioorg Med Chem2009;17:2830-2841. Arya K andAgarwal M. Microwave prompted multigram synthesis, structural determination, and photo-antiproliferative activity of fluorinated 4-hydroxyquinolinones. JBioorganic Medicinal Chemistry Letters.2007;17:86-93. Ho JZ, et al. Use of dibutyl[14C]formamide as a formylating reagent in the Vilsmeier-Haack reaction and synthesis of a 14C-labeled novel phosphodiesterase-4 (PDE-4) inhibitor. JHelvetica ChimicaActa.2005; 88:1040-1047. Wang CF and Lin YB.Synthesis of 3,4-dimethoxybenzaldehyde through Vilsmeier-reaction. JChangsha DianliXueyuanXuebao, ZiranKexueban.2004;19:87-88. Ganesabaskaran S, et al. Selective synthesis of some 4,5-dihydro-2H-benzo[g]indazoles and 8,9-dihydro-2H-benzo[e]indazoles via thereaction under thermal and microwave assisted conditions.Journal of Heterocyclic Chemistry.2006; 43:389-394. Antanosyan SK. Vilsmeier-Haackformylation of N-alkyl-3-methyl- and N-alkyl-5-methylpyrazoles.HayastaniKimiakanHandes.2006;59:99-103. Rigby JH and Danca DM. Vinyl isocyanates in alkaloid synthesisCamptothecin model studies.Tetrahedron Letters.1997;38:4969-4972. Anilkumar R and Burton DJ.An efficient dehyrohalogenation method for the synthesis of a,b,b-trifluorostyrenes, a-chloro-b,b-difluorostyrenes and E-1-arylperfluoroalkenes. Journal of Fluorine Chemistry.2005;126:1174-1184. Ashraf MA, et al.2-Hydroxy-1,2,2-triphenylethanone as an efficient photolabile protecting group for carboxylic acids. J Tetrahedron.2007;63:586-593. Agami C, et al. A straightforward synthesis of enantiopure 2-cyano azetidines from-amino alcohols. J Tetrahedron: Asymmetry.2002;13:297-302.